Rousing myself gently out of slumber simply doesn't happen. It generally takes a sledgehammer, a blast of some sort, or a shot of cold water thrown on my sleeping body. At least two alarms - my cell phone and the clock sitting across the room - do the trick these days, but believe me, I'm no happy camper before 8 AM. 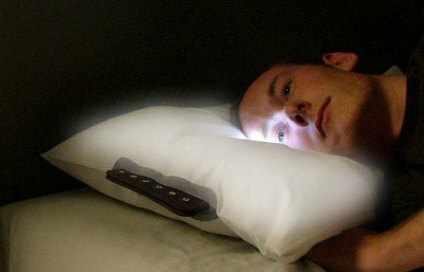 So, the "glo pillow," designed by Eoin McNally and Ian Walton, sounds like it might actually provide an alternative to the arsenal of screeching devices now utilized in my morning repertoire. The glo pillow works to set your natural circadian rhythm with light, allowing you to cycle through the five stages of REM sleep before stirring you to consciousness - a much more unobtrusive way to begin your day than a traditional shrieking alarm. rise like the sun with "glo"
Over the course of forty minutes an embedded LED light gradually increases in strength to simulate a natural sunrise. This more natural awakening via light versus sound encourages the body to establish healthier sleep patterns, and allegedly makes for a more productive, less caffeine-dependent workday. Beneath several layers of foam and netting, you'll find an LED clock display as well as a substrate of LED integrated into fabric designed by Phillips. And most importantly, the fifth layer is composed of visco-elastic memory foam for all of your snuggling needs. 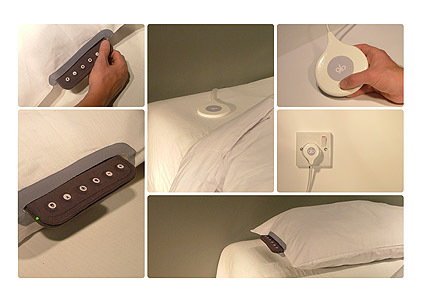 The pillow comes equipped with a panel of six "soft buttons" on the side to program it with, and a wireless transmitter allows for freedom of movement. The pillow charges by induction as necessary. As further testimony to its innovative appeal, this project received the Ideal Standard Designers Award from the Royal Society of Art Design Directions, as well as recognition in Time Magazine's Best Inventions of the Year issue. My question is: Where's the snooze button, and what might that function entail? 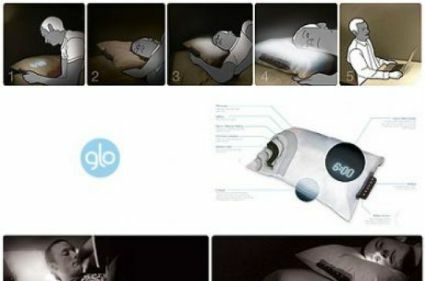 EDITOR'S NOTE: While we wait for this Glo Pillow to become a reality, the Wake Up Light may be a good option for those looking for a more gentle way to wake up in the morning.